One: Longboarding is a great way to get around! Longboarding has always been seen as a sport or hobby- it’s a way for people to have fun and enjoy themselves, get an adrenaline rush or improve their skills in their free time. In that sense, it’s never really been seen as something that’s practical for general day to day living. Usually, when someone picks up a longboard, their entire purpose is to push themselves out of their comfort zone and start a new hobby while getting some exercise; for many, it’s the next step in introducing excitement and adrenaline to their potentially boring lives. However, what many have come to discover is that longboarding is a prime way to commute around town in an efficient, comfortable way with the right setup. To start, longboarding is, with practice, surprisingly quick. As an efficient pusher, one can travel at running speeds, comfortably rivaling the cycles on the road and sharing cycle lanes. Longboards are also incredibly maneuverable, even more so than bikes and rollerblades- because they can be so small, they’re able to stop in breakneck times and accelerate back even faster. They can make tight corners, jump curbs, weave in and out of people and ride more uneven pavements and sidewalks than bikes can. Personal anecdote- most of my longboard riding has been done while commuting. It’s a great routine to have on the daily; getting ready in the morning, hopping on my favorite commuter setup and beginning my morning with a ride down my local hill. The rest of the push is easy, energizing and motivating for my day. It’s a great way to get your daily exercise, and forcing yourself to ride and push in the morning wakes you up better than any cup of coffee. Two: Longboarding exists beyond just cruising. Like I said before, many people begin longboarding to give themselves a challenge. Most people get good at cruising around boardwalks and skating their city sidewalks and neighborhoods and stagnate their skills there- they don’t feel that there’s any further to progress, both skill-wise and setup wise. Most new longboarders also buy simple, untuned completes for their first setups, not knowing that in the future, there’s much playing around to be done with new parts, Longboard wheels, and whole new Longboard decks. Board setups may start at 200 dollars, but prices have no ceiling, and the more skilled you get, the more expensive and awesome your setup will be. Longboarding beyond cruising splits into two categories: freestyle/dancing, and downhill/freeride. Freestyle and dancing involves longer, more nimble boards with kicktails. You use these kicktails to bust out flip tricks- tricks where you make the board fly into the air, do a variety of flips, and then land back on it in another variety of ways. As general as this sounds, people have made hundreds of longboard trick combinations that you can learn and chain together for impressive, flashy skill points. Downhill and freeride are the gnarlier sides of longboarding- traveling at speeds higher than 60 kilometers an hour, speeding down a downhill track busting out sideways slides and drifting corners. This style of riding takes a massive amount of certainly draining practice, along with a large serving of guts and a hunger for adrenaline. It isn’t for everyone, but it’s definitely one of the most respectable things to do. Three: Longboarding can be competitive! Longboarding has been seen as a loved pastime for a very long time, but little did you know, there are large-scale competitions that happen in both freestyle/dancing and downhill/freeride! If you get really into either discipline of riding, there are both local and international events for you to go to and exhibit your developed skills. You might win anything from small to large prize pots to wheels and extra parts for your longboards. Events are usually sponsored by companies and attended by many of the bigger names in the community. Even if you can’t skate very well, it’s always a great experience to go, as you are able to do some networking, meet interesting people and see some awesome skateboarding! In terms of freestyle and dancing, there are a few international competitions around the world, such as So You Think You Can Longboard Dance, and the Paris Annual Dock Session. In these events, you bust out cool lines and tricks, and judges from all different skate teams judge you based on style, consistency and creativity. For downhill and freeride, there are a variety of races and slide events. The easiest to host and probably most common are slide jams, where many skaters gather with their slidey wheels and try to do the most stylish trick, or slide the longest. You should have a very large and versatile quiver of slides if you wish to do well in these events. Other events are races, where you race down fast hills to beat all the others in a heat system. These may take slides or not, but rider skill is definitely something to have. There are other things, like freerides and product demonstrations, which are run by companies to celebrate the launch of a new product. Four: Longboarding is an enjoyable niche to earn money in. Longboarding and skateboarding are some of the two most customer to business friendly niches there are. With every step of the way, both workers in the industry and riders socialize and are friendly in their exchanges. Because of this, finding a job in the industry, whether it be at a skate shop or at a board manufacturer, is one of the greatest decisions you could make in your young life (if you are a teenager). Starting a board company is also a viable option for older folks, as the longboarding scene is still fast growing and it is far from stalling. At a job in the industry, you will find good wages and friendly interactions with customers. With your large base in knowledge, you will help someone who wants to get into the sport, daily. They may ask for help about a setup, and you will have an answer- and let me tell you, it’s an extremely satisfying feeling, and thus it’s something I urge all longboarders to look into. Five: The Longboarding scene is one of the friendliest communities around. It’s been a rumor that the skateboard community is a very unfriendly neighborhood to hang around- how everyone drinks a lot and every skateboarder you see is bound to be a degenerate. And you know what? That is all lies- and I will prove it with a personal anecdote. When I first started skating, I started learning alone- on a local neighborhood street with a very slight incline, and I’ll be honest, it was a lonely but enjoyable time. However, I didn’t improve much, seeing that I can’t teach myself if I have virtually no knowledge on something- so I joined my city’s longboarding club group on social platforms, and I met some people who invited me to a night skate on a Saturday. I was intimidated; I thought I needed to have some kind of basic skill in order to impress those who had invited me- but they insisted that they don’t need to see anything, that they just want me to follow along and have some fun. That ended up being one of the greatest nights of my life- socializing and talking to fellow skaters who were in it with me to get me to be a better skateboarder. And the truth is, the rest of the longboarding community is the same. If you skate alone, don’t. Find a community near you and it will become part of who you are. Last Friday myself and a You-Tuber called Ollie headed out for a skate on our Magneto electric skateboards. What an awesome way to see London at such an amazing time of year, although the day did not start well! Poor Ollies board got run over by a car at the very start of the day! Literally at the very start of the day! So it kind of made the day less fun for Ollie! We’re sending him new parts to get his Magneto Electric Longboard V1 repaired! Having said that, the sun was out, the weather relatively warm and just riding around London or any city on an electric skateboard is a liberating experience. Such an amazing way to take in the sights, the smells, the sounds. Of course, the main benefit being you can just pull up anytime and walk into any shop or Cafe’ with your board in tow. We took an Amazing route for anyone who is interested. We rode from the Tate gallery area, up past Big Ben then cut into St James Park to Hyde Park corner then through Hyde Park and finally finishing off around Covent Gardens! Ollie was on great form and recorded the entire Skate albeit I’m sure he was tired pushing! Check out the video below. That’s about it! 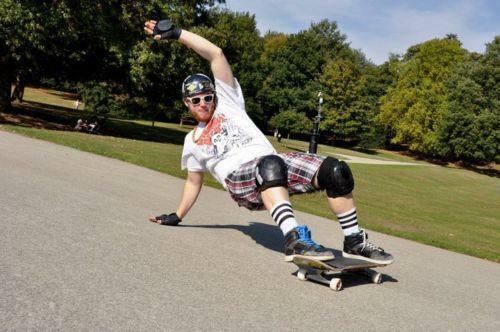 But here at Magneto, we would Love to hear your favorite skate routes and rides! Post below and share if liked this! Peace and Love to all and of course, MERRY CHRISTMAS!